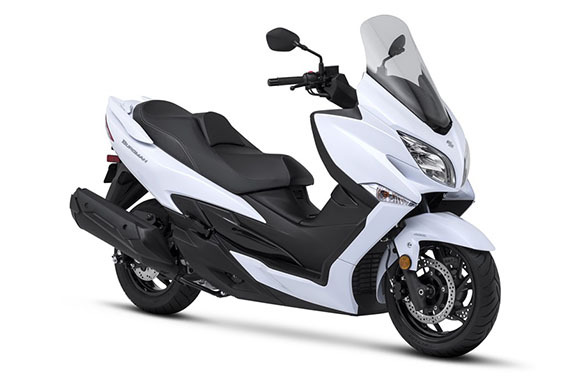 Suzuki 2018 Burgman 400 Scooter has been known for its premium features and quality since its arrival in 2018. It has become popular among the masses by its sleek design, running performance and luxuries quality, it has been the blend of advanced chassis and improved engine ability, marking it number one in the list of Best Scooters Brands in the world and changing the concept of scooters in the current world. 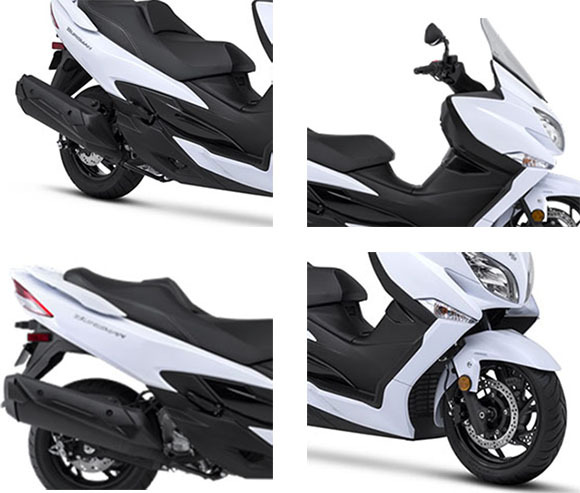 Hence, Suzuki 2018 Burgman 400 Scooter is desirable for all kinds of riders, adding to their sporting nerves, comfort, and pleasure. The idle speed of Suzuki 2018 Burgman 400 Scooter’s engine is controlled by (ISC) Automatic Idle Speed Control system whilst CVT (Continuously Variable Transmission) maintains smooth riding by providing Shock free but consistent Power supply. The intake and exhaust pipes are canted for efficient Combustion by the DOHC four valves technology. 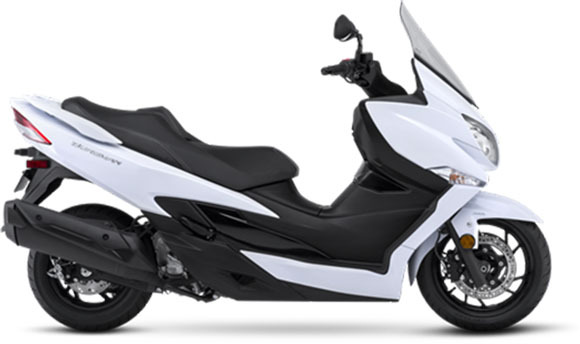 Since the Suzuki 2018 Burgman 400 Scooter’s 399cc, single cylinder fuel injected engine is facilitated with DOHC which provides slow to mid-range Torque. The log iridium spark plug not only improves fuel economy but increase the free range of 3.6-gallon fuel tank. The refined and improved fuel injection of Suzuki motorbike system equipped with catalyzer) O2 (double molecular oxygen) with PAIR system has increased the capacity to exhaust fuel. This newly made precise mechanism has very much upgraded emissions compliance. For throttle response and boost acceleration, the air cleaner assembly volume to 5 liters is comparatively 10 percent larger. It has been fitted underneath the seat which aids in emitting intake pompous sound. The newly introduced frame of Suzuki 2018 Burgman 400 Scooter is manufactured with the large diameter. Thin walled tubes aid in reducing the weight, in contrast, to scale up its rigidity. Rigidity has increased the condition of handling by 41 mm Telescopic Inner tube front forks with 4.3 inches of wheel travel. Unlike, 2018 Suzuki Burgman 200 Scooter, Suzuki 2018 Burgman 400 Scooter’ Front wheel of 15 inches has taken the place of the old modal of 14 inches to improve its stability and to give it an attractive look by this new design. The extra feature of the new front wheel is that it has 260mm disc brake rooters and 210 mm hydraulic disc brake has been attached to the 13 inch rear wheel for the motorbike users to control it easily even on crowded roads. ABS (The standard antilock brake system) has less weight as compared to the previous one for restarting motorbike with accelerating full power. T handle brake lever has located the dash near ignition switch of the latest Suzuki 2018 Burgman 400 Scooter. It is designed to prevent its movement. Windscreen has a special feature that it is abundant with a small look from the front or the sides to get you to enjoy the clearer view of the road. The newly introduced body of Suzuki 2018 Burgman 400 Scooter is manufactured to keep in mind the customers needs as well. It is slimmer, attractive and beautiful reshaped new modal. Nose features styled in dual LED headlights integrated LED position lights and turn signals on or off fitted beneath. The slimmer deck independent LED6 rear amalgamation lights with turn signals at their tails. We hope it adds agility and elegance. Pillion rider’s footrests are manufactured for the ease and comfort of the riders so they shall enjoy using it. For good grip and control, a pair of grab bars has been adjusted to each side for comfort and facility. The storage under seat space of Suzuki 2018 Burgman 400 Scooter is about 42 liters plus two front compartments with switchable illuminating lights. 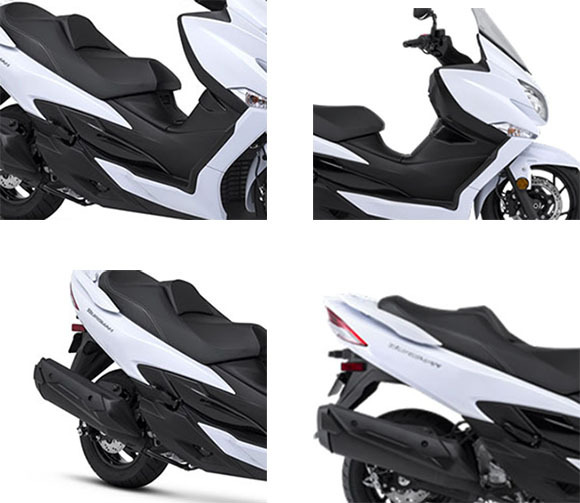 For more room, there are 2.8 L left and 3.5 L right compartment where a DC power outlet is present, the seat of Suzuki 2018 Burgman 400 Scooter has covered all the features comforting rider and passenger, it is slimmer and sleek with double stitching and accent piping; also it is stuffed with 1 inch thick padding. The Seat is facilitated with an adjustable (0.5 to 1 inch) backrest to provide ease for tiring rides. The combination of the seat changes and the floorboard position gives the more upright riding position whcih is more comfortable and sportier for the rider. Cutaway footboards support the voluntary movement and natural stopping of our latest Suzuki 2018 Burgman 400 Scooter. The duo of Seat change and floorboard position not only add to the luxurious look but sportier for users. 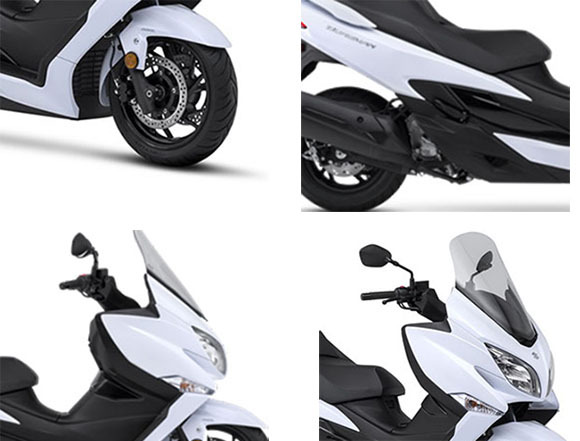 The grace of Suzuki 2018 Burgman 400 Scooter is maintained by the presence of 3 dimensional S Suzuki emblem present on front leg shield and upper meter panel. All the genuine accessories of Scooter 400 are available easily in the market. This Glamorous scooter in the price of $8,099 with a 1-year warranty. This article is all about the review of Suzuki 2018 Burgman 400 Scooter, and it is covered under Bikes Catalog. It features the best performing engine of all times that ensure an ultimate acceleration and torque. The chassis is light in weight with stylish bodywork. The suspension and braking system provides a final performance under all conditions. In short, the new Suzuki 2018 Burgman 400 Scooter is an incredible scooter for those who spend most of their time on a motorcycle traveling around the city.